Published by the Western Australian Museum, 2019. ISBN 9781925040364, 228pp, 220mm x 220mm. 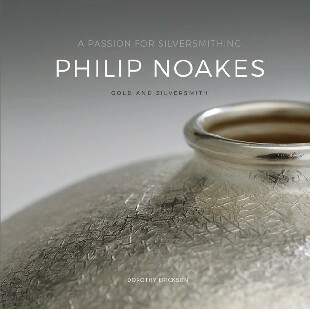 Philip Noakes’ questing mind and life’s work have embodied his constant search for the refinement of his skills, leading him to become a renowned silversmith, goldsmith and jeweller. In 2016 he was recognised as a Fellow of the Institute of Professional Goldsmiths in the United Kingdom, taking his place among the most significant artists in the world. His work delves deep into his past and utilises the full range of his skills and imagination while keeping the continuity alive with historical references and contemporary concepts to achieve the innovation and excellence he pursues. Philip is a consummate craftsman and a highly original and innovative artist who refuses to be constrained by his history. He hovers on the cusp of endless possibility, searching always for something just beyond reach. The book celebrates Philip’s achievements as a major Australian designer–maker and traces his evolution as a master craftsman, discusses the influences on his design concepts throughout his career, the people he has worked with, his working methods and values regarding art, design and skill, his role in education, and significant exhibitions and commissions. at $70.00 (AUD) each (plus $10 postage and packaging per copy within Australia). Keep updated on our latest courses and news.